I'll try to articulate this question, but feel free to call out vagueness or false assumptions. Is there a way in Photoshop to list which layers in a psd file have complex svg information in them? That is, not layers that will export to svg markup wrapping of a raster ( with an <image> tag in it linking to a raster file). But instead, ones that export to be svgs composed of <path /> or shape markup (<circle>, ...),. My hunch is that only layers that the document creator already embedded as svgs will correctly export to full information ones. My goal is to better identify and so extract such items in the psd, typically logos or other icon assets for example. These are the assets that stay crisp/sharp at any zoom level. Is there a tell in the layer menu for layers that have such information? Or a handy plugin that lists those layers in the document? 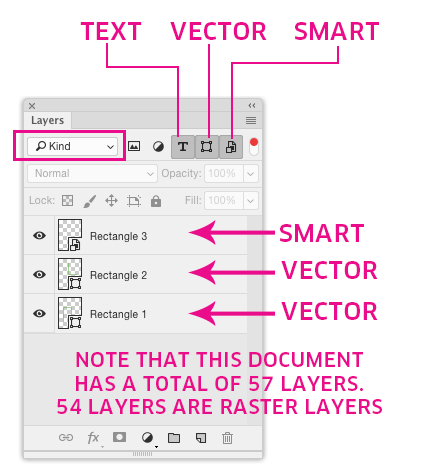 I would imagine filtering the Layers Panel for Vector layers and/or Smart object may work. I think you'd have to manually check any Smart Object layers though since they can be either raster or vector. There's no discernible way to tell what a smart object layer contains until you open the smart object. At least none which I'm aware of. Not the answer you're looking for? Browse other questions tagged adobe-photoshop adobe-illustrator svg export or ask your own question.